One of the hardest things to do as a follower of Jesus is to reconcile the idea of a fully sovereign good God with the very real evil experienced throughout the world everywhere. It does pose several challenges that are serious and possibly insurmountable. Evil exists and produces suffering for every human person. No one escapes it. Does this not reveal the utter maliciousness of the divine? For a sovereign being to allow such horror and not stop it seems to suggest that he endorses it. Does this not signify that God is evil? And that evil is an ultimate aim of existence? Perhaps God cannot stop evil. Then he is no god at all and perhaps evil is even more powerful than he. Or at least it has the possibility of “winning”. What you can’t control has the possibility of overcoming you or at least beating you. Or perhaps evil is the surest sign that there is no god at all. It is surely the strongest proof of non existence. Perhaps the universe has no meaning or benevolence. Suffering and evil is the only reality the universe gives us. And consequently, life should be filled with dread and doom. These are serious challenges. But I do think there is a substantive answer for why there is evil. The answer in summary is to realize that all these challenges assume a “closed system” where evil’s work is final. A system in which this present life and its joy (or at least the minimization of suffering) is primary because our physical death is the final end. Whatever goodness is, we must experience it now and whatever evil is we must run from it as fast as we can. But this is not the Christian story. We are eternal beings. We live in an “open system”. One filled with angels, perfected beings, the sovereign Christ, his unstoppable love, and an eternity to bring about all the good he has imagined for his people and the cosmos he has created. In other words, it is my strong belief that in Christ’s cosmos evil is a temporary reality that fades into an illusion of light in the depths of eternity. If this is true, then Goodness is everywhere. Imagine that you are married and have one four-year-old daughter. You are a devoted Christian family. You strive for what is good and love the Lord. You live a happy life. In one moment, this all changes. While at the park joyfully playing, your phone rings and you look down, she darts into a nearby forest preserve, you look up and can’t find her. Frantically you look for her. You never see her again. Later, you find out that she was abducted and killed. The killer, you find out, has done this before and was once caught but had to be let go on a legal technicality. You feel all the guilt, anger, pain and loss that comes from losing your only daughter in this way. Your marriage crumbles from the pressure of the pain and anguish from loss and your spouse leaves you. Your career, which was soaring until that day, comes to a stand still and it too dissolves into the wind of sorrow. A year after your daughter’s death you are severely depressed, divorced and jobless. All you want to do is fall asleep and never wake again. The only consolation, if you can call it that is the murderer is tried, convicted and sentenced to death. If your life and it’s goodness is measured by your physical life, evil has triumphed. But you are part of another world. One night while laying in bed an angel visits you. He tells you that his aim in his visit is to show you that all things work together for good for those who love Him and are called according to His purposes. And at the end of the visit, you will be able to choose to keep going in the timeline you are now in or go back to that moment and save your daughter. If you choose to stay in this timeline, you will forget the angel’s visit and all you learn. If you save your daughter, you will remember every detail of the visitation. With hope welling in your heart for the first time in a year you readily agree. With the angel, you go one billion years into the future. You are in heaven with the angel. You see your future-self with your precious daughter. You run up and hug her in an embrace of deep joy. When you set her down, you look at her and see that it is your daughter but somehow she is radically different. She is not a child, at least not in the normal sense. She is ancient and young wrapped up into the face you remember. She is a person of such nobility and power, beauty and grace that she seems divine. In fact, in a very real sense she is. She asks why you are there. You tell her. And then you tell her how sorry you are. How you know it’s your fault. You’re in agony. Your apology is filled with the fear of someone who has done something that cannot be repaired. You end saying something like, “I wish I could have saved you”. She laughs. Not the laugh that comes from a joke; nor is it a cruel laugh. It is the most beautiful laugh you have ever heard. It is fierce, innocent and pure. It is a laugh that comes from the depths of goodness and gladness. If the sun could laugh, her laugh was close to that. It was filled with light. And she tells you that on the day of her murder was the most joyous of her existence. In the final moments Jesus was right there. All she can remember is the joy of being held by his hands. And every moment since that moment has been one ever increasing joy. She could imagine nothing better than the eternal life she now lives. Your angel guide suddenly takes you back to the present plus twenty years. It is your daughter you see, 24 years old in what looks like a university dorm. The angel tells you that what you see is what would happen if she would not have died that day. Your daughter cannot see you. The angel tells you that she has lost her faith as she pursues a PhD in mathematics and she will never have it again. There is a sadness in the angel’s face that is so deep and final that it pierces your soul. Your ache over your daughter’s death is a mere shadow of the pain he conveys. Then, like before, your a billion years in the future and you are in heaven with your future-self. You look at him. He is unlike anyone you have ever met. He is embodies peace. You tell him your journey and the option the angel told you. You ask him what he thinks. He tells you that those few years of pain broke him. But not in a bad way. He was broken but in the way that enables something new to be made. In fact, the broken places made possible a beautiful existence. A few years after the death of his daughter, his relationship with Jesus would flourish. In the depths of pain, he found real peace. He found the Lord. He never married again. But what he learned in the valley of the shadows gave him a power and substance that gave hope to thousands during his life on earth. And in the billion years since that earthly life, the peace only deepens. He tells you that this one moment of horror made him into the man he always wanted to be. In fact, he learned it was necessary for him to be the man God created him to be. So not only has he accepted God’s willingness to allow such suffering, these days he celebrates God’s goodness in allowing it. There is no doubt but the assurance of a man who deeply knows something true. If a perfect person could beg, you saw such a thing that day. Your future-self tells you that this is the road to goodness and without it, goodness will be lost for you. You are stunned and confused but also you see the beauty of this future moment. You turn around and you see the murderer. You remember the way he looked in court, cold and malicious. But now he is radiant. And if you had to choose one word to describe him it would be, “safe”. Anger wells up and pain causes your body to convulse uncontrollably. He waits. He begins to weep. Real sorrow. But it is upheld, somehow, in love and goodness. He is sad but not shameful. You look in his face and you see something you have never seen before–love, sorrow, regret and joy infinitely combined into radiance. This radiance is his self. In fact, it would be impossible to divide the light from his soul. They are one in the same. 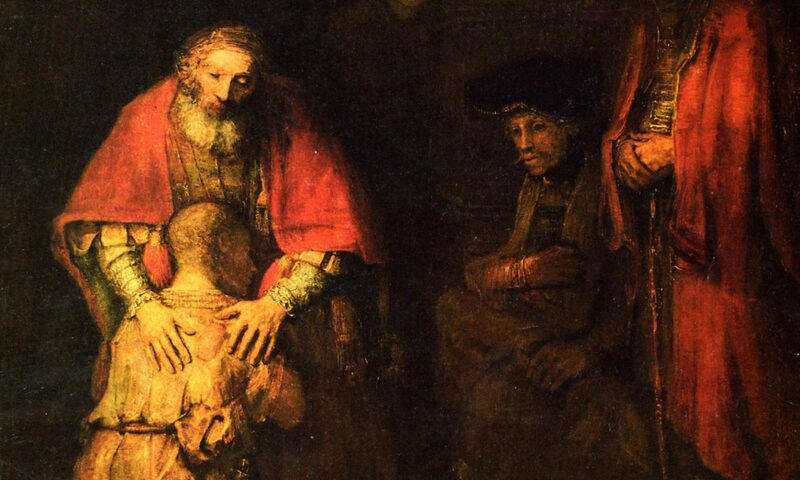 He tells you that he is sorry for his heinous sin, and asks for mercy. You ask how he could even be in heaven. He tells you that in prison, 5 years after the murder, you visited him. You forgave him and shared the goodness of the risen Christ. He accepted and walked with the Lord until the moment he was executed. The story of reconciliation between you and him was told and thousands came to the Lord. He knows from eternity that those thousands would only have come into eternal gladness because of this story of forgiveness. If it did not happen, they would never know Christ. Lost forever. The angel touches your arm and you are back in your home, in the present, alone. There is a note that reads: I will be back in one week for your decision. The next week is like the last year, lonely and filled with anguish. Your daughter and marriage or forget and embrace the pain? Thank you for this thoughtful, impactful work, Ron. It has been so helpful to have these huge concepts, that I know to be so, put into story.